6 reasons why you should do an engagement session! I wanted to share my top 6 reasons why engagement sessions are so valuable... since after being in this industry for awhile, I've answered all of the questions below and you might be wondering the same thing! "Do we really need an engagement session? We already have our save the dates designed so we don't need them for that." "We were going to have Uncle John/my best friend/my brother take them because they can't wait to try out the new camera they just got and have taken a few photos of us before..."
"We have a really tight budget. Can we eliminate them from our wedding package to save money?" "My fiance really isn't going to be into it..."
"I'd rather have my teeth cleaned than stand and pose in front of the camera with a stranger." Hold on, I NEED TO STOP THIS LIST RIGHT THERE and say this: I can promise you by the end of our session I'll have you laughing, snuggling up and holding hands more naturally than you ever thought possible. Strangers will be smiling at you (if we're in a more public place) and I will be cheering you on as you feel silly and laugh yet look like you belong on the cover of the magazine that would exist if GQ and Vogue merged into one fancypants stylish publication for BOTH of you. I love engagement sessions with my couples!! I think they are so valuable to our entire experience together that they are complimentary in all of Urban Row Photography's wedding packages. My goal is to always give you the most enjoyable experience and professional coverage for your wedding day and I don’t want to give you anything less than my best! 1. Our time together during an engagement session functions like a rehearsal for your wedding portraits! That’s right… the rehearsal for your wedding day *photos* happens months in advance of the actual rehearsal dinner fun. The connection we make helps me learn the quirks and unique gestures that you and your fiance have together; it helps both of you become comfortable around me and in front of the camera. This helps me capture you both in the most natural, flattering and authentic poses at both the session as well as your big day! Helpful hint: if you really want it to feel like a true dry run, try coordinating your session with your hair and makeup trials; it will allow you the chance to see how they show up in photos and BONUS… you’ll feel extra glamorous and confident! It's so easy to get wrapped up in the wedding day details, planning, guest count decisions, etc, that another reason I enjoy engagement sessions is that it's time for you and your love to be in the moment with each other with no additional stress of the next planning deadline to occur or finding time to make sure you are in touch with Aunt Martha from California. It's just you two in a place that's full of meaning to you! Helpful hint: the location of your session is next in importance to taking engagement photos in the first place!! This is where the fun begins! Are you envisioning an urban look to your photos? Maybe downtown along the waterfront? What about exploring a historic cobblestoned street? Or a more natural garden aesthetic? Maybe a local flower farm? Or a cozy, woodland look? Or a timeless and classic historic mansion? 3. This moment in time is unlike one that will ever happen again. It's the beginning of your family's love story. Think about it; your life's path has now been forever altered in the best way possible. You deserve to to have gorgeous, timeless photos to share and show to your loved ones years from now. Sharing how you both looked, felt and even what you wore when you officially began your journey together is so important. It's not a phase or a season you'll ever get back and I'm pretty sure your kids will love looking through your engagement photos while hearing you tell your version of the proposal story. Heck, I've heard my parents story 17 times but I've yet to see a photo from that period in their lives... and I so wish I could! 4. Bringing your pet to the wedding may not be feasible. 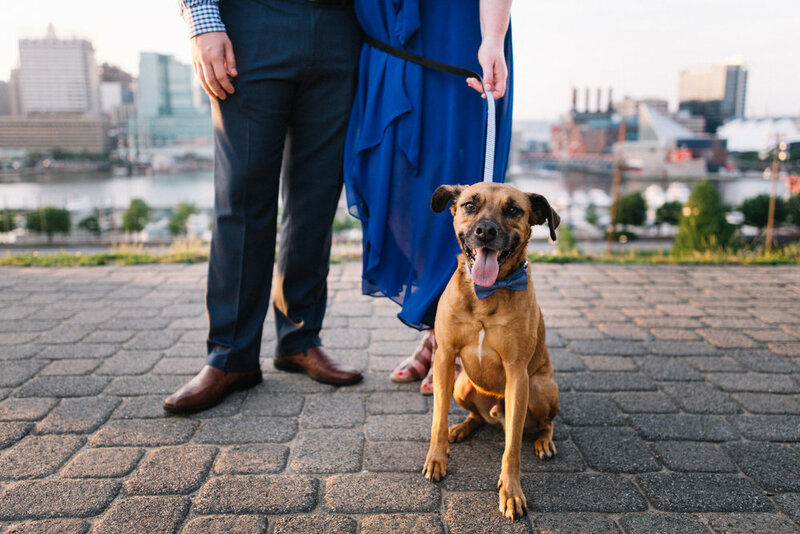 So furry friends are welcome at your engagement shoot and actually... ENCOURAGED! Your little fur-baby plays such a large part in your life and they are generally absent on your big day for logistical reasons (although I'd LOVE it if they were there! Who is planning to have their pet included in their wedding day and/or ceremony!? Let's TALK!!). So, I love when my couples include some time during their engagement photos to involve their pets. Let's be honest, when was the last time all 3 of you got behind the camera together? Those first 'family' photos become just as important a keepsake as your wedding ones! 5. My FAVORITE compliments following engagement sessions are from the grooms telling me how they weren't expecting to have so much fun during the shoot! 6. Focused time with your bling... since your fiancé probably spent a ton of time (and $$$) on it! 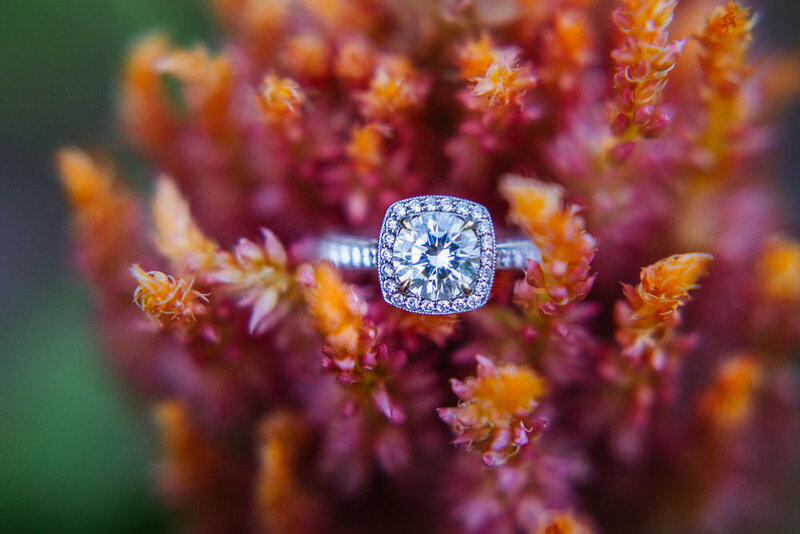 Everyone asks to see the ring once you're engaged and I love taking a few moments to showcase your new sparkly bits! New, antique, unique, I love seeing them all and learning more about your proposal story and why that specific ring was chosen by your fiancé. These are just a few reasons why I not only enjoy capturing your love during the time you're an engaged couple, but also why I feel it is so, so important. Just like our first meeting, the engagement session is a powerful way for our relationship to grow as we gear up for your wedding. We spend so much time together on your wedding day, it's almost fitting that we have a fun photo 'date' before the big day!